A quick recipe for rich, creamy, and slightly spicy Mexican hot chocolate. One sip and you’ll never go back to those packets again. *This post was originally published on 12/8/2011. The pictures and recipe have been updated. This recipe for Mexican Hot Chocolate might take a few minutes longer than a pre-made hot chocolate mix but it’s worth every second. A rich, creamy, perfectly spicy and fragrant mug will warm you up even on the coldest winter day. Don’t forget the marshmallows or whipped cream topping! Last year I was in New York City meeting a friend for lunch in Chelsea market. After stuffing our faces, we were walking around trying our best to resist the urge to buy all the amazing gourmet items from cheeses to every kind of olive oil you can imagine to spices and salts when we came face to face with a little shop selling hot chocolate. I can’t for the life of me remember the name of the place but it really doesn’t matter. All that matters is that they had Mexican hot chocolate on their menu and I was sold in about .3 seconds. It was thick, dark, smooth and just slightly spicy. Lately, on nights when tea doesn’t cut it, hot chocolate has been my go to treat. 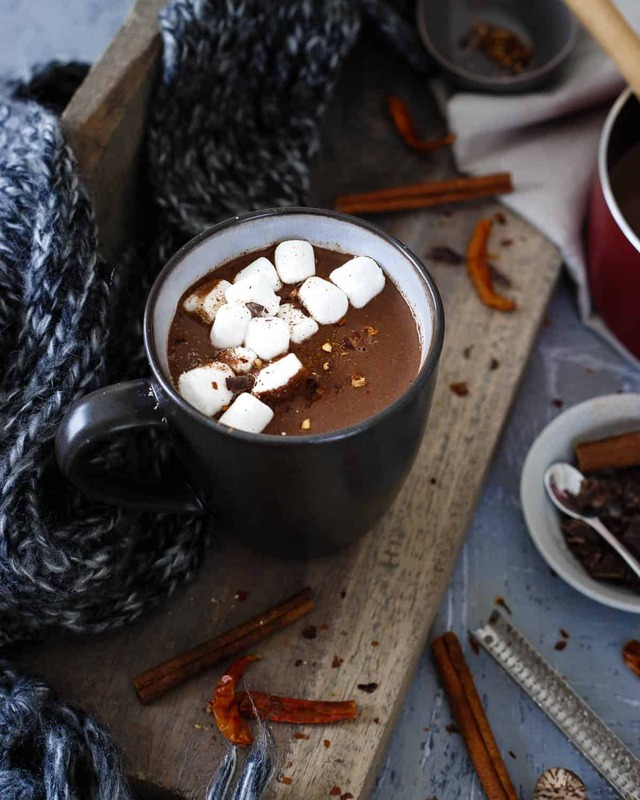 Sometimes I like sipping on this tart cherry hot chocolate, other times I like this easy pumpkin hazelnut hot chocolate but when I’m in the mood for a bit of spice, nothing beats Mexican hot chocolate. So, I took a stab at recreating that amazing chocolaty goodness since Chelsea market is a bit too far of a hike when the craving strikes. What makes it “Mexican” is that third ingredient, the addition of spice! Let’s talk about all three ingredients though because when the ingredient list is short, the quality matters a little more than usual. The milk I use depends on my mood. If I want an indulgent, creamy and thicker Mexican hot chocolate, I use whole milk or at minimum, 2% milk. If I want to keep things a little lighter, I’ll usually choose a non-dairy alternative milk like an unsweetened almond/coconut milk. I always choose unsweetened when I use non-dairy milks because I prefer to control the sweetness level myself by adding the sweetener of my choosing and the amounts I like. I love using dark chocolate in Mexican hot chocolate. The slight bitterness goes really well with the spice in a way that milk chocolate just can’t replicate. I suggest using 70%-75% dark chocolate or 80% if you really love dark chocolate! Ah, the fun part – spice! 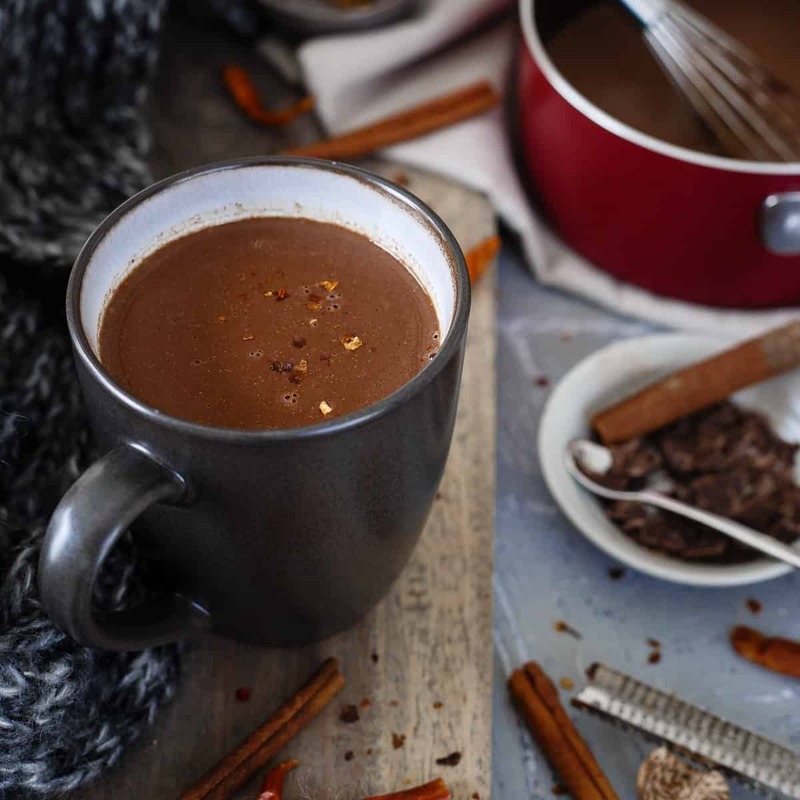 Some recipes for Mexican hot chocolate will just use ground spices like cayenne pepper but what I think makes this Mexican hot chocolate recipe special is the addition of a dried chile pepper to the simmering hot chocolate. The spice permeates the milk and chocolate as it simmers on the stove-top and imparts the perfect level of heat throughout. You can of course adjust the heat to your preference by adding more dried chiles or using a small one, or using just the dried chile and not adding the cayenne pepper as the recipe instructs. A cinnamon stick, cinnamon, nutmeg and salt are also used to help balance out the spiciness of this drink. So put down the instant Swiss Miss packets away (do people seriously still buy that stuff these days?!) and get the saucepan out. When you can have a mug of this Mexican hot chocolate in under 20 minutes you’ll never even consider a packet hot chocolate again! Don’t miss this coconut chai hot toddy or this apple cinnamon tea latte either, they’re great cozy warm winter drinks too! Combine milk, chile pepper and cinnamon stick in a small sauce pot over medium-low heat. Bring to a low simmer for about 10 minutes until cinnamon is fragrant, stirring occasionally so milk doesn't burn or boil. Add chocolate, sugar, vanilla and spices and whisk until the chocolate is melted and the mixture is smooth, about 4-5 minutes. Remove cinnamon stick and chile pepper from the pot. Pour into a mug and top with dash of cinnamon, cocoa powder, red pepper flakes, marshmallows and/or whipped cream. *You can use any milk, nut milk or milk combination you'd like. This looks soooo amazing! I drink hot chocolate everyday, and this is an easy way to spice things up, literally. I read somewhere recently about adding just a dash of chili powder into hot cocoa and ever since its been on my mind. Glad I found this post! I’m definitely making this tonight.. no wait.. I have plans to drink wine tonight. Tomorrow night, for sure. I’ve made Mexican Hot Chocolate cookies but never the real deal beverage. Sounds pretty simple, too! now I want a cocoa and a trip to the chelsea market. I’m sure I have a reason. I can come up with one, I’m sure. I’ve been having hot chocolate every night this week to make up for the debacle that was the DC hot chocolate run. I totally want to try this. Have you ever had a mexican chocolate bar? It’s FANTASTIC! Yes! I was actually going to use it in this until I pulled out my chocolate bag (yeah, I have a chocolate bag) and realized I ate it all last time. Oops. No, but sounds fab. As does your version. Must try!!! Ooh I have been craving hot chocolate all week, this sounds amazing!! I’ve always been a plain chocolate kind of gal but I am dying to try some new flavours… mexican chocolate is high on the list!! Hi Julie! Thanks for stopping by :) I found you yesterday through those delicious looking marshmallows on Foodgawker (or one of the food sites.) They are gorgeous! Will would love this recipe! He’s a hot chocolate lover but I’ve always been ashamed at the fact that I don’t know how to make it from scratch. YUM! Are you thinking of the Godiva hot chocolate? I worked at a Barnes and Noble that served Starbucks coffee, so I’m not sure if they served the drink at real Starbucks, but it was SO rich. It was made with half and half instead of milk and a super rich powder- way too sweet, even for me! Maybe…but Starbucks called it something. Some fancy name they had for it, it’s driving me crazy not being able to remember it! Hello Zippy Hot Chocolate! I think I love you!!! YUMMMMMM!! Ok, I need to make this and I need to make it now! Saw this on Healthy Aperture and had to try. Had it last night and for breakfast this morning! SOOO good – I used chipotle chili powder for the kick. Really enjoy many of your recipe ideas/photos – great blog! Thanks Deanna! Just rescued this from spam, no idea why it went there! I just bookmarked a Mexican hot chocolate recipe. Forget that! I’ll go the Matsoukas route! Delicious! I’m coming back to copy this recipe down. My sister doesn’t do coffee type drinks but looves hot chocolate! I think it was called Chantico. Yes! That was definitely it! Thank you, it’s been driving me crazy not being able to remember the name. love the heat in here!!!! yeah! Love the little spicy kick to this! Mmm sweet and spicy!! Love this! Nothing quite like homemade hot chocolate! Yum!! 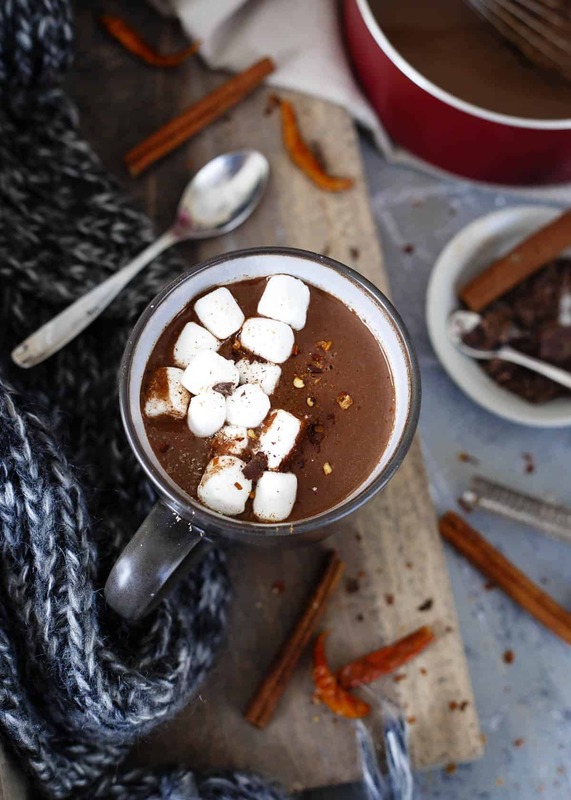 This sounds like the perfect cozy hot chocolate! I LOVE the sound of this Gina! What a perfect winter warm up! Warm and tasty perfection in a mug! That’s how I’d describe this Mexican Hot Chocolate! Yum! Love love LOVE Mexican Hot Chocolate!